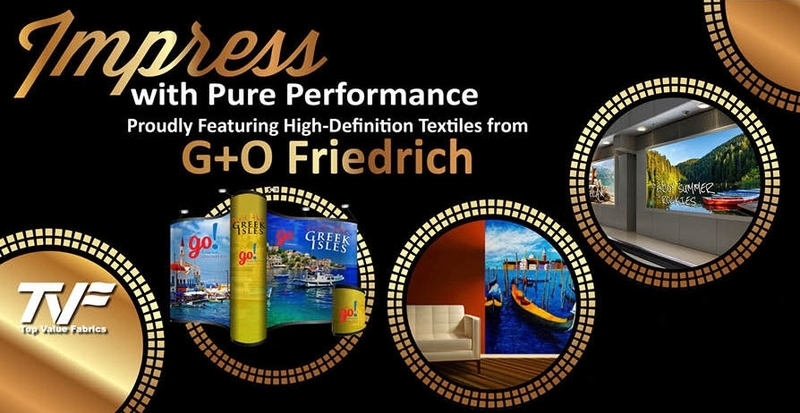 We’re proud to introduce our new line of print media textiles, High-Definition Textiles from Georg+Otto Friedrich. This line is engineered specifically for brilliant graphics displays. With the growing popularity of digital fabric printing and textiles for direct printing, our High-Definition Textiles yield incredible color, clarity consistency and definition. This line relaunches fabrics that were previously offered by Pacific Coast Fabrics, which TVF acquired last year. We have strengthened the partnership with G+O to stock the collection through expanded, nationwide distribution. Our line of High-Definition Textiles is comprised of a full range of styles, with options in backlit, blockout, mesh, flag and frontlit display fabrics. All of our High-Definition Textiles are REACH Compliant and OEKO-TEX® STANDARD 100 Certified. Request a sample today and see the quality for yourself! Call us at 844.618.4500 for additional information or click here for details on our complete line. To learn more about our partnertnership with Georg+Otto Friedrich, click here.